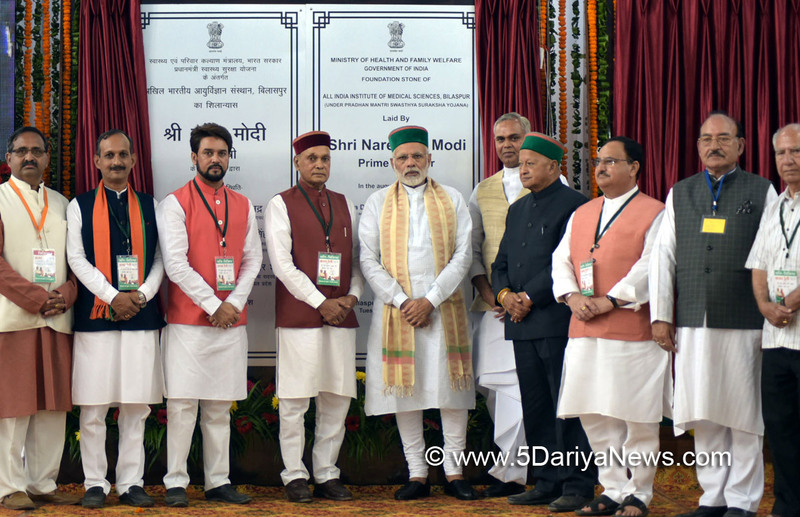 Prime Minister Narendra Modi along with Governor Acharya Devvrat and Chief Minister Virbhadra Singh performed the foundation stone laying ceremony of the All India Institute of Medical Sciences (AIIMS) to be opened at Kothipura in Bilaspur district. Union Health Minister Shri Jagat Prakash Nadda was also present on the occasion. To be constructed with an outlay of Rs 1351 crore, the AIIMS will benefit the people of Himachal Pradesh immensely. The people will not need to go out of the state for advanced medical checkups or for getting themselves treated for various ailments of serious nature.The AIIMS is proposed to be constructed in around 205 acre of land provided by the State government way back to the Union Health Ministry. Shri Virbhadra Singh was quite worried over the delay in laying foundation stone of AIIMS as several times he expressed his concern for it and time and again urged the Union Health Minister and even the Prime Minister for speeding up the process for setting up the pioneer health institution in the state. He hoped that the institution will come up soon in near future to provide succour to the people of the state and thanked the Prime Minister for laying its foundation stone. He urged for getting it completed at the earliest so that the people get quality health services at their very door-steps. Initially, the AIIMS will have 20 super speciality blocks having 750 bed capacities. It will have intake of 100 MBBS seats and 60 nursing seats per batch per annum. All the departments will be interconnected with commercial and residential area inside the campus.The Prime Minister laid foundation stone of Indian Institute of Information Technology (IIIT) to be set up at Saloh in district Una. As much as 60 acre of land was made available for the purpose in 2014 by the Technical Education department of the state government for paving the way for construction of IIIT. The IIIT will be constructed at the cost of Rs. 128 crore. The Government of India will bear the 50 percent cost, while 35 percent of the finances will be borne by State government and the remaining 15 percent by industry partners, namely HP Power Corporation and HP Power Transmission Corporation. Initially, three courses have been started in IIIT, the guest classes of which were started in NIT Hamirpur for academic session 2014-15. The courses available are computer science engineering, electronics and communication engineering and information technology with an annual intake capacity of 160. This is the 20th IIIT in the country.The Prime Minister also inaugurated the Steel Processing Plant constructed at Kandrori, in district Kangra completed with an outlay of Rs 70 crore and will have steel production capacity of one lakh tonne per annum. The Steel Authority of India started the work of steel plant in 2014. This will give direct and indirect employment to the youth of the state.He also launched Tata Digital Nerve Centre for Bilaspur and Kullu districts for quality primary health care. It will facilitate the quality health care in rural areas of the state. An initiative of Tata Consultancy services, the digital nerve centre has touched 15 million people throughout the country.Earlier, the Chief Minister welcomed the Prime Minister and other dignitaries at Luhnu helipad in Bilaspur.Union Steel Minister Shri Birendra Singh, Union Minister Shri Thawar Chand Gehlot, former Chief Ministers Shri Shanta Kumar and Shri Prem Kumar Dhumal, Union MoS for Steel Shri Vishnu Deo Sahai, Union MoS HRD Shri Satya Pal Singh, State Health Minister Shri Kaul Singh Thakur, Technical Education Minister Shri G.S. Bali, MP Shri Anurag Thakur, MLAs and others were present on the occasion.